This is an easy homemade granola that can be made with ingredients you probably already have in your pantry! It’s subtly sweet, a little salty, and filled with holiday spices that will make you feel all kinds of cozy. Granola is one of my favorite things in the world. It’s crunchy, crispy, sweet and just delightful. I feel like it gets a bad rep though. Mostly because most store bought granolas can be full of sugar and processed ingredients. 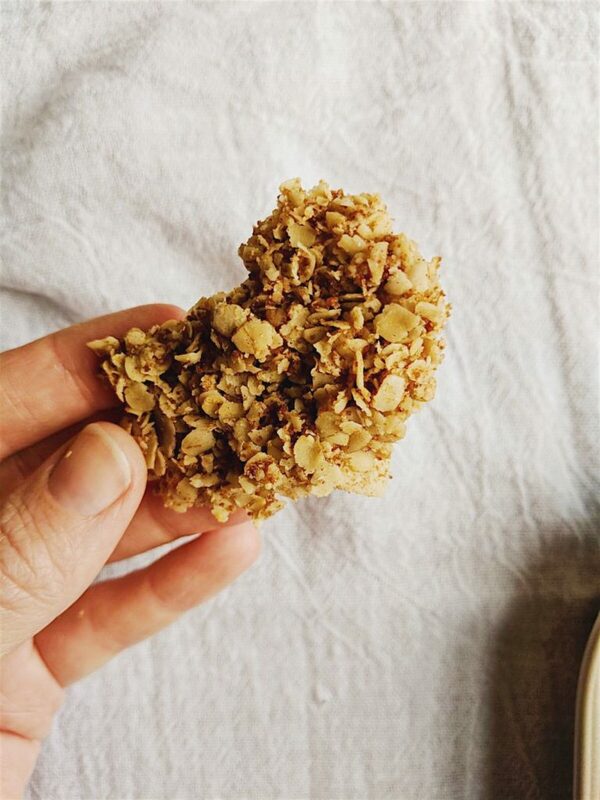 This granola is full of heart healthy delicious ingredients like rolled oats, coconut sugar (which has a lower glycemic index than most sugars! ), unsweetened coconut chips and lots of cozy spices like cinnamon, nutmeg and pumpkin pie spice! The coconut chips give it a delicious crunch without adding any sugar – only healthy fats! Did you know fat is good for you? I didn’t until probably about a year ago. I mean, hello, it was drilled into my head for years that fat was the enemy! 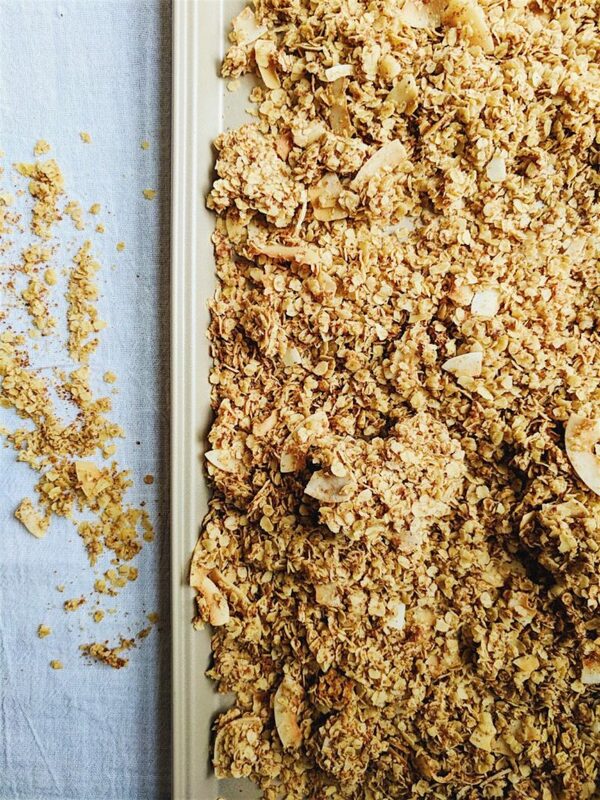 By making this granola at home, you get to control everything that goes in it! The best part? Granola is SO customizable! You have chia seeds? Throw them in there! Dried fruit? Why not? Chocolate chips? UM OK. Seriously, anything that you think sounds good, why not! Oh and one last thing. This granola is THE BEST to give as gifts! Not to mention cost effective! With Christmas right around the corner, this would be the perfect stocking stuffer for your loved one! Note: Resist the urge to stir around the granola once done. Let it cool by itself! This is how those delicious chunks will form! Oh, and when I mean chunks I’m talking about…. Oh yes. That’s the good stuff. Find the recipe below! I enjoy this granola the best on top of my overnight oatmeal (oats on oats! ), yogurt bowls, smoothie bowls OR just by the handful. No judgement here! 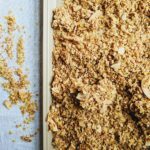 A delightfully caramelized and crunchy granola that is subtly sweet and filled with cozy spices. 2/3 cup oil of your choice (coconut, butter, ghee) I used ghee in my recipe! Add rolled oats, coconut sugar, coconut chips, and holiday spices to a large bowl. Mix well. Melt your oil or butter and mix until all the ingredients are coated. Add in the maple syrup for extra stickiness. Pour bowl onto a baking sheet and bake for 50 minutes. Do not stir halfway through! Just let it bake. After 50 minutes have passed, turn the heat to 300 degrees and bake for an additional 10 minutes. 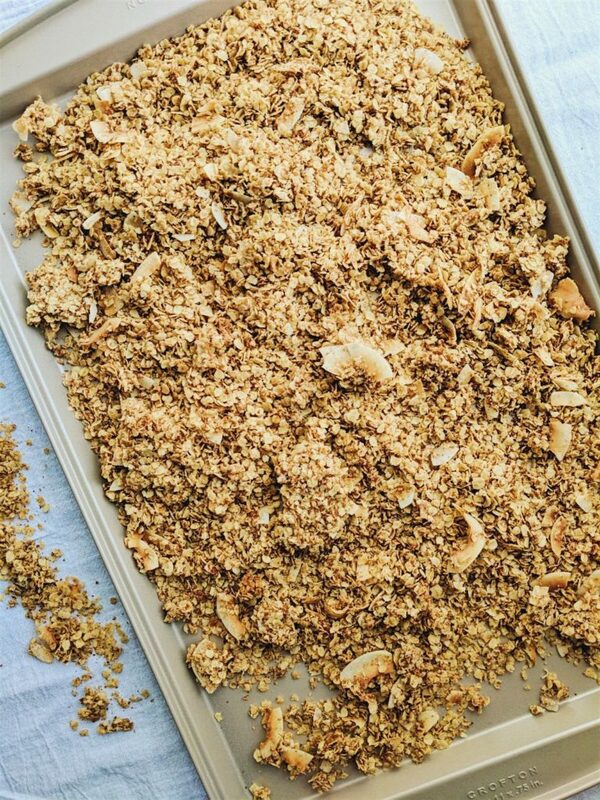 For extra crispiness and caramelization, broil the granola for 1 minute. Once done, sprinkle with sea salt and let it cool. Store in a jar and eat it up! Lasts for a week to a week and a half.